Dr. Jefferson Chan is a pathologist working in Orange, California that currently works at UC Irvine Medical Center. 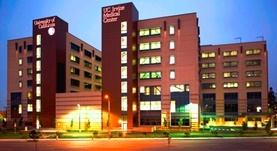 He offers his services at the University of California, Irvine Medical Center. He got his diploma from University of California San Francisco School of Medicine and did his residency years in Anatomic and Clinical Pathology at UCSF. The doctor is certified in Clinical Pathology and has an experience of more than 20 years. Dr. Jefferson Chan has contributed to 3 publications. Increased energy expenditure, UCP1 expression and resistance to diet-induced obesity in mice lacking nuclear factor-erythroid-2 related transcription factor-2 (Nrf2). Schneider, K.,Valdez, J.,Nguyen, J.,Vawter, M.,Galke, B.,Kurtz, T. W.,Chan, J. Y.; J. Biol. Chem.. 2016 Feb 05. Disease Modeling and Gene Therapy of Copper Storage Disease in Canine Hepatic Organoids. Nantasanti, S.,Spee, B.,Kruitwagen, H. S.,Chen, C.,Geijsen, N.,Oosterhoff, L. A.,van Wolferen, M. E.,Pelaez, N.,Fieten, H.,Wubbolts, R. W.,Grinwis, G. C.,Chan, J.,Huch...; Stem Cell Reports. 2015 Oct 13. Induction of Herpud1 expression by ER stress is regulated by Nrf1. Ho, D. V.,Chan, J. Y.; FEBS Lett.. 2015 Feb 01.